How to work with lightboards and get the most of them. Lightboards are private folders where you can store your personal assets. These folders are accessible and visible to you alone. That means you can store here sensitive information and all kinds of assets that cannot be shared with the rest of the team for various reasons. In the left side panel you can see a lightbulb icon. When you click on it, you get access to your list of lightboards and the default folder “My first Lightboard”. Here you can add new lightboards, rename them, upload assets, or delete them altogether. All lightboards are automatically arranged in the alphabetical order. How can I upload assets to lightboards? 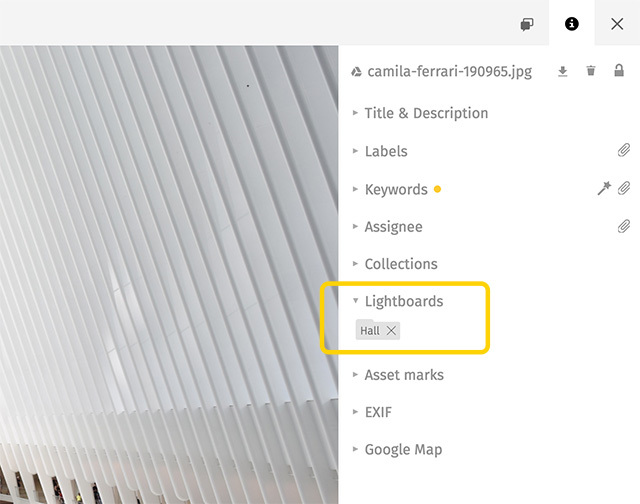 You can upload assets to your lightboard directly from your device in the same way as you upload files to usual collections. When you upload assets in this way, you can attach different keywords and leave comments about them. 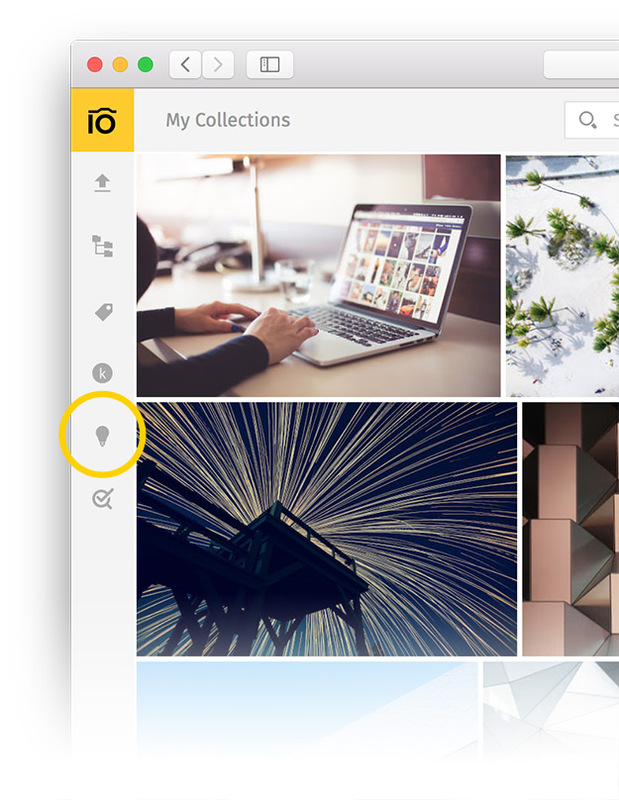 You can also upload assets from your shared collections in Pics.io. For that, you should open your collection and select asset(s) you want to add to your lightboard. Then open your list of lightboards and simply drag the selected asset(s) into the lightboard you want. NB There’s one important comment here for those who use Team Drive. The latter restricts the location of your assets to only one folder within Team Drive. It means that you can’t have copies of one and the same asset both inside a shared collection and inside your lightboard. Please read more about lightboards in Team Drive here. What can I do with assets in my lightboards? You can do a variety of things with assets in your lightboards: rename them, attach keywords, add revisions, edit custom fields, and sort them with the help of flags, star rating, and color labels. Be careful though. If these assets are also present in your shared collections in Pics.io, all the changes you make here in your lightboard will be also visible to your teammates in other places in Pics.io. Once an asset is uploaded to a lightboard, it receives a tag with the name of this lightboard. You can see this tag in the Infopanel of the asset. If this asset is located not only in your lightboard, but also in a shared collection in Pics.io, this tag is only visible to you. It means that only you know that this assets also belongs to your personal lightboard. What happens if I remove an asset from a lightboard? You can remove assets from your lightboad in a similar way as you delete files from ordinary collections. You can simply detach it from the lightboard, by clicking on the cross next to the name of this lightboard in the Infopanel. If you have this asset also stored in some other shared collection (not possible for Team Drive), the asset will be removed from the lightboard, but it will remain in other collections in Pics.io. If you have this asset stored in several lightboards at a time, you can safely detach it from one lightboard, and it will remain untouched in other lightboards. If the lightboard was the only place where you stored your asset, detaching it from this lightboard will delete it completely, beyond retrieval. Please note that if you choose to delete your asset by pressing "Move to trash" button, your file will be deleted from all lightboards and collections it was stored in, and end up in the Google Drive trash folder. How can I share my lightboard with others? You can always share assets from your lightboard by selecting them and moving to a shared collection where they will be visible to other teammates.